Solid Meranti Timber Cricket Bat Entrance Door. 820mm x 2040mm x 40mm(thickness). Solid Meranti Timber Cricket Bat Entrance Door. 870mm x 2100mm x 40mm(thickness). Solid Meranti 1/2 Glass Timber Door. 820mm x 2040mm x 35mm(thickness). Tempered Glass Fitted. 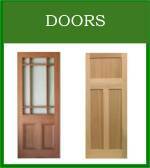 Solid Meranti Timber & Glass Door. 820mm x 2040mm x 35mm(thickness). Tempered Glass Fitted.